Jumpstart Your Business With This 4 Step Cheat Sheet! Follow these steps and see what happens! 1-Write your monthly goal in a very direct, brave and aggressive manner. As silly as it sounds, I believe that most people never really write out their goals on paper. Proclaim you goal to the masses, to the universe and to people who will support you to get there. Many people are unconsciously scared of success. 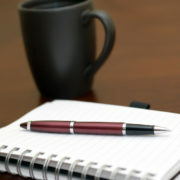 Writing and verbalizing your goals creates clarity, purpose, focus and paves the way for clear actions. So write your goals out by hand, and make them at least one page. Resistance in business can be an indicator of where a business owner needs to take action. The greater the resistance, the greater the success on the other side. Be aware that you mind will always want to take the path of least resistance, which leads you away from the key things that will grow your business the most! Push through the fear in identifying your next action. 3-Take action immediately to get a check in the box! Tony Robbins® always says, “A person’s success in business is directly proportional to the amount of risk and uncertainty they can manage.” In other words, you must push through your fears and take action, NOW! Forget your need for perfectionism, forget your need to learn more first, and forget your need to be able to explain “why” if you are trusting your gut-feeling. What is important is that the risk you are taking is clearly and directly leading you forward towards your desired goal. If there is still uncertainty after working through steps 1 through 3 as to a clear next step? 4-Take a few minutes and get organized. A cluttered desk, office space, or environment is a clear indication of a cluttered mind. Take a few minutes and clear your space of anything that is not needed. Have everything find a home. It is amazing how a clear, clean working environment can produce clear, clean thinking! Write out your goal fearlessly and fill up an entire sheet of paper. Take immediate action and never look back or question it. If needed, create a clear, clean environment and start over! https://www.executivecoachinglifecoaching.com/wp-content/uploads/2015/05/Jumpstart-your-business.jpg 365 548 James https://www.executivecoachinglifecoaching.com/wp-content/uploads/2017/05/Logo-Evolution-for-Success-executive-coaching.jpg James2015-05-06 08:30:002017-05-19 15:57:09Jumpstart Your Business With This 4 Step Cheat Sheet! Life Coaching Tip: Stay Ignorant!! !